NOSE DIVE is a casual gastropub. It’s Greenville’s “food forward” destination where creativity and modern culinary techniques take center stage to create urban comfort food that is approachable by all. Our chefs create and feature dishes that are both interesting and comforting. The culinary team is dedicated to focusing on inventive fare and attention to detail. You’ll enjoy high quality food, craft cocktails, a selection of handcrafted beers and hand-selected wines—along with superior customer service and a warm neighborhood feel in the heart of Downtown Greenville. 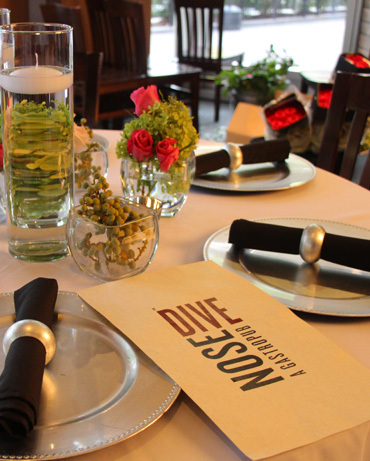 NOSE DIVE has a variety of private and semi-private dining areas, including the Private Dining Room and our Main Dining Room, which can perfect for any type of entertaining need. For any of our events, guests may order from the current restaurant lunch or dinner menus, or our team will work with you to customize menus for each event. Beverages are charged based on consumption. To get started planning your special event, please contact Rachel Maurer at 864.373.7300 or fill out our form below. We can’t wait to hear from you! A great space for the larger occasion, NOSE DIVE can be rented in its entirety. The Main Dining Room can seat up to 100 guests for a plated meal and up to 150 guests for a standing reception utilizing both our Main Dining Room and Crafted cocktail lounge. Ask your sales rep for food and beverage minimums. Our Private Dining Room (PDR) is located behind the restaurant. The PDR can comfortably seat 22 guests for plated meals and can accommodate up to 30 for standing cocktail receptions. The room is available for reservation during lunch, brunch, and dinner hours. The room offers an A/V package rental options as well. CRAFTED, our upstairs lounge, can accommodate up to 30 guests for a plated meal and up to 60 for a standing reception. Crafted is available during lunch and brunch hours for private events. Crafted has a beautiful relaxed and rustic aesthetic with a trendy chic touch throughout! The area has an open feel with an indoor balcony overlooking Main Street.